How many times have you had this after school conversation with your child? Why does it alwyas feel like pulling teeth when you ask about your kid’s day? 1) Don’t ask ‘yes’ or ‘no’ questions. This question will get your kid’s attention. And sometimes, you’ll find out more than you would expect. If your child tells you he or she got in trouble in school, don’t react right away. You want your kid to feel comfortable talking to you when he or she does something wrong. It’s a great precedent to set while your kids are young. Ask what your child would do differently next time in that situation, so hopefully it doesn’t happen again. 3) Turn “How was school today?” into a fun game. Step 1 - Take a piece of paper and write down 5 questions about the school day. Step 2 - Write down 3 bonus “reward” tickets that say “snack” or “tv”. Step 3 - Cut out all the questions into thin strips and put them into a bowl. Step 4 - Have your child pull out 3 tickets. As long as they answer 3 questions, or get lucky with a bonus ticket, they win a small reward! Now my kids are excited to play this quick after school game, and I learn a lot more about their day! 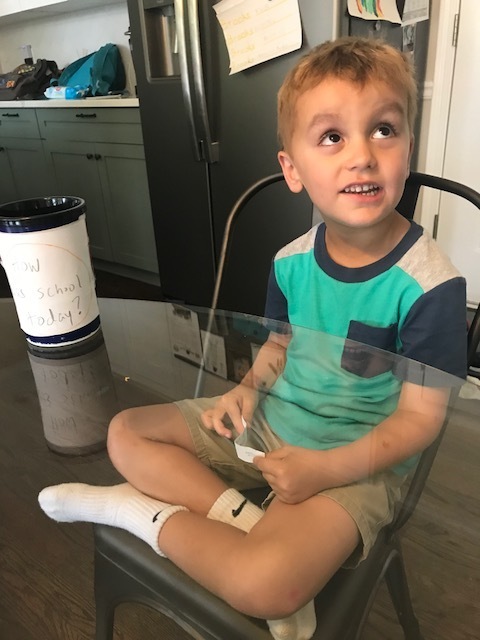 Speech Language Pathologist, Allison Geller at Connected Speech Pathology has some more great questions and tips to get your kids talking! I hope you get some answers tomorrow when your kids come home from school!